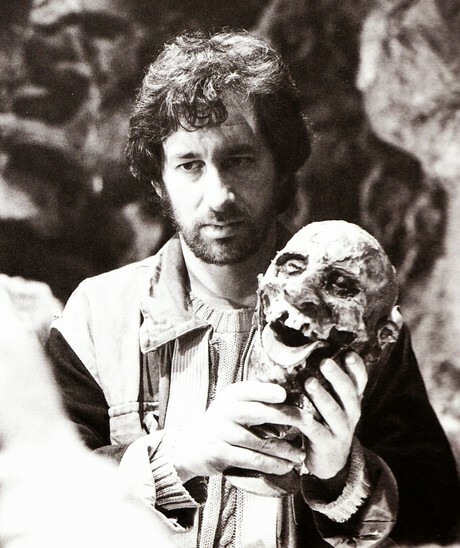 FORTUNE AND GLORY: 1984 Steven Spielberg on Indiana Jones and the Temple of Doom! Ahoy, squirts! Quint here. I tried my best to get Steven Spielberg to consent to an interview for this series. I pestered the poor people at his office for at least 6 months (I'm not exaggerating), but it just wasn't meant to be, sadly. The man is a little busy and Temple of Doom isn't his favorite. I'm a little bummed, but I get it. Honestly, as much as I wanted to get him on record for this series I also kind of wanted to make my argument that this movie he made is better than he gives it credit for to the man himself. You know, play Short Round to Spielberg's Indiana Jones and wake him up from his own personal black sleep of Kali. When it became apparent that I wasn't going to lock in Spielberg I was a little stuck. How can you run a week-long celebration of a big blockbuster movie from one of the most famous directors ever and not have that director's voice included? The thought hit me that the only thing better than modern day Spielberg talking about the movie is 1984 Spielberg talking about the movie, so I went on the hunt for interviews from 1984 and hit he motherload when I dug up the Temple of Doom issue of American Cinematographer. It took all of my willpower not to just reprint that interview in full, it's that good. Not only is Spielberg his typical conversational self (always a huge help to any interview), but he's fired up about the movie. This is before the negativity surrounding the violence knocked his enthusiasm back. Sure, he's selling it, too, but you can feel how genuinely proud of the film he is here. 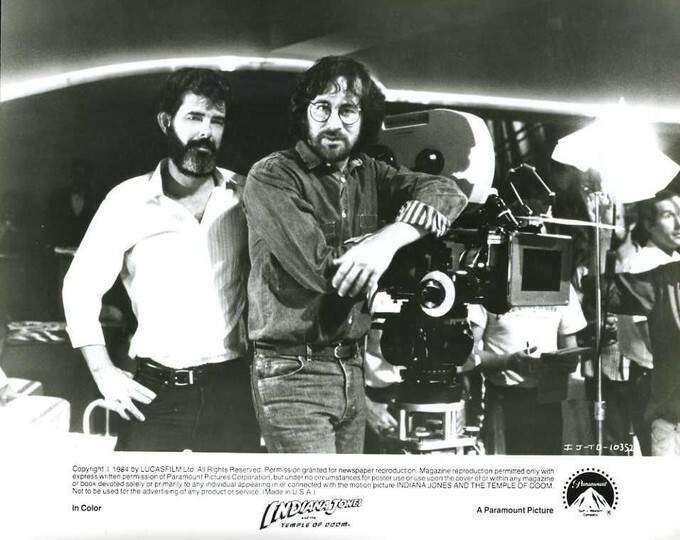 Let's dive into some wisdom from the Beard, thanks to a July 1984 American Cinematographer article edited by Merry Elkins. 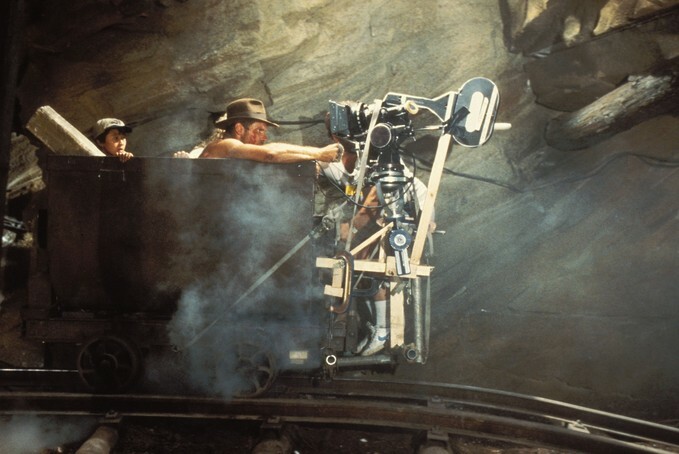 Below, Mr. Spielberg discusses the inspirations for the visual style of the film, his work with cinematographer Douglas Slocombe, his storyboarding process, juggling a complex production, how important (or not) realism is to an adventure movie and the iconic mine cart sequence. Enjoy! “In many ways, the visual style of the film was conceived when George told me the story, which was a very rough sketch of the movie he wanted us to help him construct. I heard a couple of things. I heard Kali Cult and Thuggees. I heard temple of doom, black magic, voodoo, and human sacrifice. When he said words like temple of doom and black magic, what came to mind immediately was torchlight and long shadows and red lava light. I felt that dictated the visual style of the movie. Once you're underground, there's no sunlight seeping through. I wanted to paint a dark picture of an inner sanctum. I didn't rely on magazine pictures as I used to, looking at National Geographic pages or in a photography magazine to show the cameraman what I liked. I relied more on what it would look like if an entire set had only low wattage light bulbs recessed in nooks and crannies. It suggested the Bela Lugosi light you put under the vampire's face that casts a nose shadow across the forehead. It suggested a lot of spooky, creepy, crawly, nocturnal imagery. “All the lighting effects were floor effects as opposed to putting in a graduated filter or putting on a coral filter or even hooking a piece of cyan gel to the lens. Dougie Slocombe likes to mix light and so do I. We agreed on that for Raiders of the Lost Ark, even though Raiders had a different visual philosophy. Raiders was outdoor adventure and the sun was our ally. In Indiana Jones and the Temple of Doom, the arc, 10k and the baby were our allies. Often just the light of an actual torch was plenty with the assistance of the new fast 94 stock. “The color scheme evolved out of many production meetings with our costume designer, Anthony Powell, myself, Elliot Scott, and Dougie Slocombe in deciding what the film was going to look like. I wanted it to be filled with bright colors like a classic Technicolor movie. I especially wanted the banquet sequence at the beginning of the picture to be like The Adventures of Don Juan. Palatial, flashy, and motley in the choice of primary colors for the costumes and walls. Decadent. We wanted it to be bright and gaudy. To mislead the audience and make them think, with the dancing girls and exotic characters and their colorful costumes, that Indiana Jones' adventure was going to take place on the surface of the world. But the minute he goes into his room at night and discovers the secret passage which leads into the inner sanctum and eventually to the Temple of Doom, I wanted the shift in style to be very dark and low key. ”Dougie Slocombe likes to mix light and so do I. We agreed on that for Raiders of the Lost Ark, even though Raiders had a different visual philosophy. Raiders was outdoor adventure and the sun was our ally. In Indiana Jones and the Temple of Doom, the arc, 10k and the baby were our allies. “We had a budget of $28 million, and we delivered Paramount a $28 million movie. I went over budget in some sequences, and came in under budget in others. I went over schedule with certain scenes, and came way under in others. It was almost all a wash. We actually came in five days under schedule. “When I'm sketching an angle, I draw seven or eight frames that tell a small story. I do the thumbnails myself, which are often absolutely impossible to interpret, and I need to stand over the artist to explain which side is up. These shots are all subject to change, and I usually don't shoot every one. I always overdraw. I draw more than I can possibly shoot in one two-hour movie. Then I begin cutting the storyboards down, taking seven or eight different frames, and finding one shot that symbolized everything I want to say in those drawings. That gives it economy and substance and a lot more energy. I cram every bit of visual information into one frame. The audience today, especially with the influence of television and the 30-second, often 10-second commercial, is seeing faster than they saw in the '50s and '60s. With every generation born, kids are taking information in quicker than we did when we were kids. I don't have to hit the audience over the head with seven shots when two might tell the story, the two that really have all the information in them; then I'll find areas to bridge with little cut-away I might want to do to protect myself if the scene's too long in the editing room later. “The best example of this is in the spike chamber where I drew several renderings of insects crawling over Kate Capshaw. I had all sorts of shots planned showing the migration of bugs up and around the actress, and I was going to do a study of that. But once I got on the set and saw how she was reacting to being around the bugs, I felt the best thing to do was throw the storyboards out and take one camera and hold Kate wide, and a second camera panning from the bugs up to her face. I shot most of her footage that way, with two cameras at the same time, reacting as she would react. We were being as spontaneous as she was. The situation for her was very real, as it would have been for anybody having a thousand creepy insects crawling all over her body. “Storyboarding also performs another service which I find fundamental. It exhausts me. It makes me tired and a little bored with the sequence. In a way, I've already shot that sequence by sketching it; then, by reviewing the sketches I'm able to look at the sequence and say, this has no imagination. This is not interesting. It forces me to rethink each scene. Often I'll sketch something in a safe manner, in a way that if worst came to worst, if it stormed and we lost a day I'd have something to fall back on. And now we're on to the big mine car sequence. Spielberg talks a lot about how they shot this, the experimentation that went into figuring this sequence out and what it was like to actually ride around in the rig. This stuff is amazing. “For the mine car chase, Elliot Scott and I designed the mine train full scale on one large sound stage in London and Dennis Muren, our special effects supervisor, matched what we built for the miniature shots. I didn't quite know what I wanted this mine train chase to be. I had some elaborate storyboards, impossible to put on screen, and Elliot Scott told me he didn't think he could do it justice with one circular track. So he built some variety into that track by constructing it on three levels. It goes 15 feet over the camera, then dips down to about two feet off the ground, then down one foot, down two feet more, back up to ground level, and finally back up eith feet. What we actually did was build a rollercoaster ride on the sound stage. And it really worked. It was safe. It was electrically driven. You could take rides in it. “We built two loops, the main train loop and a dolly track loop. 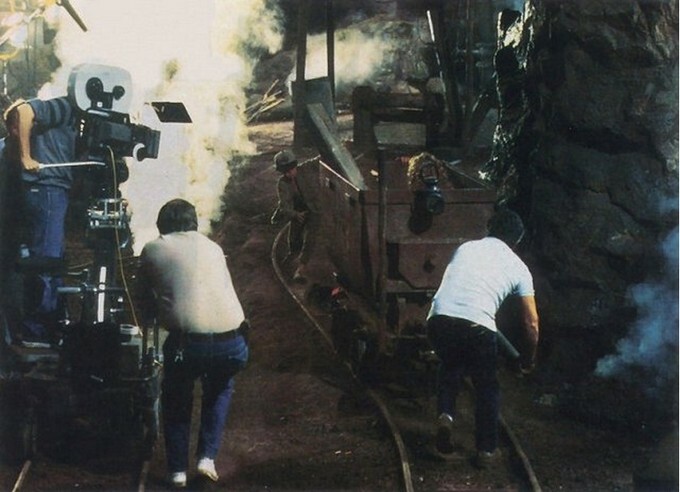 I could sit on the camera with Chic (Waterson) operating it, and five people pushing the dolly from behind, we'd travel at the same speed as the mine train. “One of the secrets to making that scene realistic was not locking the camera down. There are many mount shots that study Indiana and Willie in closeup. There are no process shots in the sequence at all. I used master shots with run-bys, or the camera was in the car, or running next to the car with the actors in the car. “Before we shot, we did a steady test. What we discovered was that we could not get the camera steady. The photography on the first day of testing was almost unusable because the camera shook so much when it was in the mine car. Everyone said, 'Gee, this looks terrible.' And I said, 'No, it doesn't look terrible. It looks absolutely realistic.' I took several rides in the mine car and this is what it looks like. It made my fillings fall out. This is what it feels like to be in a mine car without shock absorbers, racing downhill. I loved the fact that the camera never was steady. We even began to loosen the mounts as we shot so it would register more vibration. “For the run-by shots, I found when I used a wide angle lens, it was too smooth. It was like a boat-to-boat shot on a calm lake. So, I only shot from the dolly to the mine car with 75s, 100s and 180mm anamorphic lenses. This in itself made it hard for Chic because he was struggling to keep the actors in frame. But it gave a very realistic effect. Then Dougie and Paul Beesen, who both helped to shoot the sequence, put very hot lights every 20 or 30 yards so there would be sweeping shadows as the people went through different colored lights. We were careful to change the color of the gels so the actors never went through just white light. They went through reds, oranges, yellows, and greens. This gave the feeling of speed and variety of location. “Since we were going in only one direction, and never faster than ten miles per hour for safety reasons, what we did was shoot an entire loop of the track with yellow light. Then I'd ask Dougie to change all the gels in his lamps and go totally straw, and we'd do another pass in straw light. Then we'd come back and I'd ask Dougie to light half the set in straw and half with red as if they were going through fissures where lava rivers flowed beneath. Then on the same boring circle, we'd go around with the actors and they'd do the dialogue involving the red color. Every time I went around the track, Dougie kept varying the lighting. The marvelous thing was that just by changing the position of the lighting and the color gel over the light, you never felt you were in the same part of the circular set more than once. The set itself never changed, though we did build a section of parallel track for what we called the taffy pull with Short Round between the two cars and the live action footage was supplemented with miniature footage. The high overhead shot of Short Round between the two cars going over the lava pit, for example, is a miniature. “One day, accidentally, the actors went through a large lump of smoke. The effects man didn't take the B-smoke and properly paddle it evenly across the track. He created a cloud that hung in the air. When the mine car hit the cloud it created a contrail which flowed off the shoulders and hat of Harrison Ford, and I just loved it. It was an accident, but from then on I had the effects man lump his clouds in mid air. “Even though the mine car wasn't going fast, it looked fast because we shot parallel to and very close to rock walls. When you drive in your car you can be going five miles an hour out of your driveway, but if you've got a retaining wall, it looks like you're going 45 miles an hour. That's why we shot a lot of the sequence flat to a wall. Now that Mr. Spielberg's voice has been included (even if it is a 30 year old echo of his voice) I feel like we can finally wind down this Fortune and Glory series. Don't worry, there's still one more big piece to go. Keep your eye on the left-hand column for a nice, juicy exclusive interview to put the final period on this series.